Does anyone have any information on sPzJg Abteilung 654? At one point in the war it was commanded by a Major Noak, probably in 1944-1945. What was this unit armed with? Any help would be greatly appreciated. Thank you. In june 1944 it had a complete establishment of 42 Jagdpanthers. sPzJg Abt 654 made up half (along with sPzJg Abt 653) of sPzJg Rgt 656 at Kursk in July 1943. Each abteilung fielded 45 Elephants. 653 was commanded by Major Steinwachs, 654 by Maj Noak and 656 by Oberst v.Jungenfeldt. I believe that after Kursk the unit participated in the futile attempt to hold the large bridge and dam at Zaporozhye in October '43. When you're in command..... command! Formed 26th August 1939 in WK.X. 3,7cm Pak35/36 (mot.) with one platoon of 4 2,8cm sPzB41. Two Kp with 12 7,5cm PaK40. One Kp with 12 7,5cm PaK97/38(f). Three Kp each 8 7,5cm Pak40 and 4 7,5cm PaK97/38(f) per Kp. 1.Kp had 9 7,5cm Pak40 and 1 7,5cm PaK97/38(f) operational with 1 7,5cm PaK97/38(f) needing repair. Two Kp had NO AT guns at all. 2.Kp issued 9 Marder II, it turned its guns over to the 3.Kp. 16 more Marder II issued. Attached to schwere-Heeres-Panzerjäger-Regiment 656, as II.Abteilung. Had 44 Elephant [should have been 45 but one was lost when unloading], 5 Panzer-IV(lg), 5 obsolete tanks [? Panzer-Kpfw.III(kz) ?]. All Elephant transferred with crews to schwere-Heeres-Panzerjäger-Abteilung 653. It was the ONLY Jagdpanther unit to receive its full establishment of 42. Issued 6 Jagdpanther and 28 Pz.IV/70(V). Issued 20 Jagdpanther and 3 Pz.IV/70(V). Just wondering: where do you find this kind of massive information?? Hard work is the short answer. Up to about 10 odd years ago I had been collecting information and noting it for about twenty years. I decided to computerise it which was fine until Word messed up an awful lot of my files. All I have left is about a third of the original German files, those dealing with equipment and basic OOB. One side problem is that if anybody asks where the information comes from I cannot say, all lines of information had a simplified book reference of a letter and one or two numbers, a main reference book might be M11, an intelligence source I23 and so on. However without the file that says what they are, the references become meaningless, as they are in another lost file. Every now and then I wander onto a sight like this and if I see something I have information on, it goes on, as it did in this case. Many thanks to all who have posted!!!! Wow!! I am always able to count on this forum to provide me with more than I originally hoped for. Thank you Vos, David, and Jerry. I found information on Jason Long's Sturmvogel site which has helped as well. Thank you gentlemen for taking the time to post. It looks like this abt. was around for a long time and saw much action. If you want to get real depth information about the fate of the Abteilung throughout the 2nd WW, try to obtain a copy of the excellent "Combat History of Schwere Panzerjäger Abteilung 654" by Karlheinz Münch. 650+ pages full of photos and first hand information inculding large parts of the war diary. This book does hardly leave open any questions and is available through J.J. Fedorowicz Publishing. Thanks for the info Martin! I just took a look at the book on-line and it looks great. I have a feeling all of my questions would be answered in its 650+ pages. Best wishes. David, have to compiment you on your info. But, having The Combat History of sPzJgAbt 654, I have to disagree with some of your data. On 1 June, 1944 issued 5 Jagdpanthers that you do not list. As of September, 1944 you list them fully equipped, the book indicates they are missing 22 Jagdpanthers. In October they receive 9 Jagdpanthers on 13 Oct and 7 Jagdpanthers on 23 Oct. In the fighting around Kantemirovka, the Panzerjager-Abteilung 654 had heavy casualties and lost almost all vehicles. Therefore, it was relocated to the Reich in early 1943 and organized anew in Hamburg-Harburg. The reorganization was completed towards the end of April 1943. Subsequently, the detachment moved to Rouen, where it was equipped with the heavy tank destroyer "Ferdinand". The schwere Panzerjäger-Abteilung 654 was formed on March 22, 1943 in Rouen, France. Reason for the renaming was the equipment of the detachment with the heavy tank destroyer "Ferdinand". It was now divided into HQ Company, 1st - 3rd Companies and workshop company and was under the Panzerbrigade 10. In mid-May 1943, the first Panzerjäger "Ferdinand" arrived in Rouen. The HQ company received three, the Panzerjäger companies 14 Panzerjäger "Ferdinand" each. By the end of May, all tank destroyers had arrived in Rouen. In June 1943, the division was assigned to the schweren Panzerjäger-Regiment 656 as the II. Abteilung (detachment), but remained virtually as one independent army force. From the 13th to the 15th of June the detachment was loaded in Rouen and relocated to Russia. On June 24, the first parts of the department were unloaded in Smijewka, about 35 km south of Orel. The detachment made its first deployment in Chotetowo, about 20 km north of Smijewka. In the next days followed the detailed exploration of the deployment area on the railway line Orel - Kursk. Ferdinand and Elefant tank destroyer. Thomas Anderson. Finally on June 27, 1943 the deployment was put into effect in accordance with the 'Zitadelle' directive ... The only reason for postponing the attack is the weather, or a preemptive attack launched by the enemy. It is likely that none of these events will occur. On June 29, 1943, the day passed in silence, and so the deployment of the units in their assembly areas near the front ran smoothly in accordance with the plans. The weather (cloudy with rain) was favorable, since the aerial reconnaissance of the enemy was hampered and the dust formation of our own vehicles was reduced. A big problem was the noise. 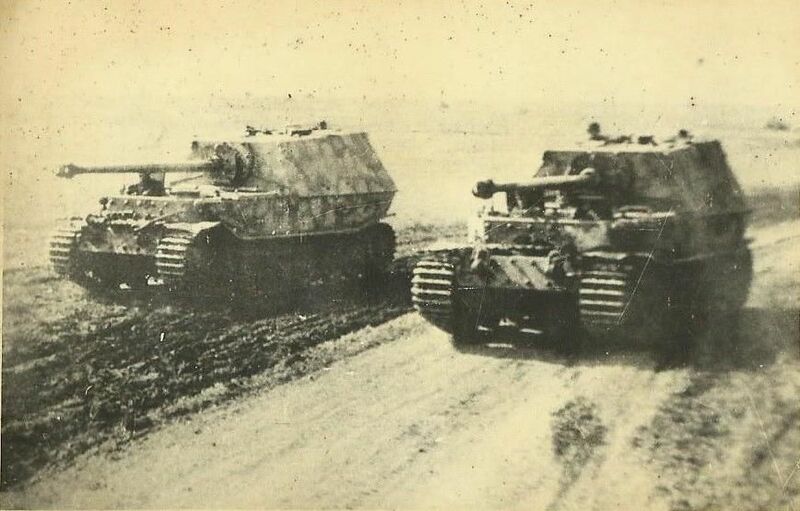 This is of great importance because the 'Ferdinands' (Porsche-Tiger), which were traveling along the Kromy - Smijewka road, generated with their engines a loud noise that could be heard at a distance of 30 km. Air patrols were planned over this concentration area. From June 30, the detachment marched in three night marches towards its initial position 1 - 3 km behind the first German line on the west side along the Orel - Kursk railway line. July 2, 1943. The noise of "camouflage" to cover the approach of the "Ferdinand" by airplanes only partially succeeded, since these had to stop flying due to the weather. It is predicted that the weather for the next night will be similar, the 'Ferdinands' will remain in their areas. Kursk - In the attack. In June 1943, the German forces concentrated their troops and means on the Kursk salient. Until the end of the month, the sub-units of Pz.Jäg.Rgt 656 reached the northern flank near the city of Orel as an important part of the 9th Army. Together with the sPz.Abt. 505, the regiment formed the fist that would allow the German troops to break the heavily fortified Russian lines. July 6, 1943. The second day of the German offensive was characterized by intense fighting between armored vehicles, developing an extensive tank battle in front of the Corps at the focal point. With surprising speed, the enemy was able throw into combat its regional reserves, but also large parts of its operational reserves to battle. At this time, the German armored units are at full strength, their supply routes are short, as well as the flanks to be protected are smaller.